The thing I tried recently is Pizzaman. It’s in the Nikuman case at the cashier counter. It was amazingly good. I was truly impressed. The way to explain Nikuman in English is bun filled with pork, so Pizzaman is bun filled with pizza sauce and cheese. The cheese in the bun was so good. You gotta try it! I found some YOUTUBERS introducing familyMart products. Try to listen to how they explain the food. They use words like cheesy, saucy, and crunchy. Basically, many words to express taste ends with “-y”. Try to pay attention to those words. Many men love the movie “Rocky”. I am one of them. I think men, especially in my generation, love it. It’s a cheesy movie but I still love it. Recently, I went to see Creed 2 which is a continuation of the Rocky series. Of course, Sylvester Stallone is in the movie. The movie always has the same message. The message is no matter how hard the obstacle if you don’t give up, you will overcome it. I love movies with that kind of message. 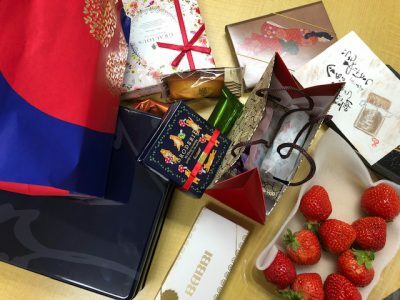 Many students gave me things for valentine’s day. Thank you very much. The only way I can give you back this kindness is through my service. I’ll do my best to constantly improve my curriculum, teaching, and overall service. 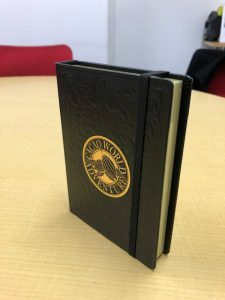 One student gave me a chocolate box that looks like a journal. I thought it was funny because I think I know what she wants to say. “You always give us journal homework so I’m giving you journal chocolate”. I think she has a good sense of humor. Copyright © Master English All Rights Reserved.